ROY PORTELANCE, LOUIS (he also signed Roi, Roy, and Roi Portelance), merchant, politician, and militia officer; b. 16 Oct. 1764 in Saint-Joachim parish (at Pointe-Claire), Que., son of Joseph Roy, dit Portelance, and Catherine Mallet; d. 2 March 1838 in Kamouraska, Lower Canada. Louis Roy Portelance was the son of a farm labourer from Lachine on Montreal Island who had married a young widow from Pointe-Claire. He studied at the Collège Saint-Raphaël in Montreal from 1778 till 1784, and subsequently signed up as a voyageur in the fur trade. When on 7 Sept. 1791 he married his first cousin Marie-Josephte Périnault at Notre-Dame church in Montreal, he was 26 and a resident of that town. The bride, aged 31, already had three sons from her marriage to Jacques Varin*, dit La Pistole, a Montreal silversmith who had died in January of that year; the eldest, Jacques, then almost 14, attended the wedding. 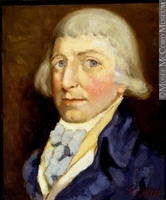 On 2 May 1792 Roy Portelance became the father of a daughter, Sophie, the only one of his children who would reach adulthood, and it was she who on 10 Jan. 1814 married Montreal merchant Frederick Glackmeyer, son of Quebec musician Frederick Glackemeyer. Roy Portelance became a lumber merchant shortly after his marriage. He set up in business on Rue du Saint-Sacrement, between Rue Saint-Éloy (Saint-Éloi) and Rue Saint-Nicolas, on lots he had purchased when the property in the dissolved communal estate of his wife and her first husband was sold. He also purchased an orchard in the faubourg Saint-Antoine and bought his father’s land at Lachine in return for a life annuity paid to his parents. Subsequently he acquired two more properties in town, one on Rue du Saint-Sacrement, the other on Rue Saint-Pierre, which he rented to merchants and schoolmasters. Roy Portelance’s main commercial outlet was the Montreal market. No trace of transactions for exporting lumber has been found in the notarized deeds. He profited from Montreal’s growth in population at the turn of the century, supplying boards and planks to numerous woodworkers, carpenters, and entrepreneurs in the town and its suburbs. Among his customers was a major building contractor, Charles-Simon Delorme. Roy Portelance obtained part of his wood from his brother Jacques, who owned a sawmill at Saint-Régis and every spring sent him some cribs (small rafts made of tree trunks, boards, and planks), each worth nearly 1,000 livres. By now quite prosperous, Roy Portelance was one of the local élite in the early years of the 19th century. 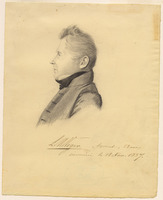 Respected by his fellow citizens, he sat in the House of Assembly for Montreal from 1804 till 1815, and then for Montreal East from 1816 till 1820. 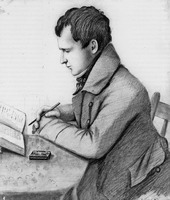 In the 1804 elections he obtained 1,183 votes, the other candidates, Benjamin Joseph Frobisher* and Denis-Benjamin Viger*, receiving respectively only 769 and 445. 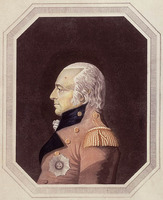 During the War of 1812, like a number of the assemblymen, he served as an officer in the militia of his riding. 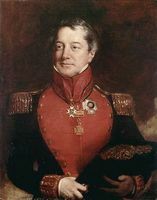 He received a captain’s commission in Montreal’s 2nd Militia Battalion on 3 April 1812 and later he was promoted major and lieutenant-colonel. On 4 Sept. 1809 Roy Portelance, who had been widowed on 6 Jan. 1808, was married again at Quebec, to which town his parliamentary duties took him. His marriage in the cathedral of Notre-Dame to Louise Languedoc, daughter of a Quebec merchant and sister of François Languedoc, was solemnized by his stepson Jacques Varin, then parish priest in Terrebonne. Three children born to the couple would reach adulthood. Mme Roy Portelance died in 1818 at 33, following childbirth. Roy Portelance had probably quit the lumber business some time in the 1820s, content to live on his income. On 12 Feb. 1835, however, he joined some merchants loyal to the Patriote party in forming the partnership of Viger, De Witt et Compagnie, which would also be known as the Banque du Peuple [see Louis-Michel Viger*; Jacob De Witt*]. In the autumn of 1837 Roy Portelance left Montreal and went to live with Jacques Varin, who was now the parish priest of Saint-Louis at Kamouraska. He died there suddenly on 2 March 1838, aged 73, and was buried in the parish church on 5 March in the presence of politicians Jean-Baptiste Taché, Joseph Robitaille, and Amable Dionne*. Louis Roy Portelance seems to have been quite an important Montreal merchant in the early 19th century. Esteemed by his fellow citizens, he adopted the ideas of reform held by many in the French Canadian bourgeoisie of the time. His political activity remained limited, however, probably because of his advanced age when the crisis of the 1830s reached its dénouement. ANQ-M, CE1-2, 13 juill. 1840; CE1-37, 17 oct. 1764; CE1-51, 7 sept. 1791, 2 mai 1792, 14 sept. 1794, 29 juill. 1797, 7 janv. 1808, 10 janv. 1814, 9 juill. 1818, 29 sept. 1829, 7 août 1832, 21 janv. 1834, 17 sept. 1838; CN1-74, 30 août, 25 sept. 1798; CN1-134, 1824–35; CN1-194, 25 oct. 1808; CN1-202, 17 oct. 1760; CN1-270, 1824–35; CN1-305, 1824–35; CN1-313, 7 mars 1809; CN1-320, 1824–35. ANQ-Q, CE1-1, 4 sept. 1809; CE3-3, 5 mars 1838; CN1-230, 3 sept. 1809. PAC, MG 24, B2: 1607–9. La Minerve, 18 févr. 1835; 8, 18 mai 1837. Allaire, Dictionnaire, 530. F.-J. Audet, Les députés de Montréal, 360–63; “Les législateurs du Bas-Canada.” Caron, “Inv. de la corr. de Mgr Hubert et de Mgr Bailly de Messein,” ANQ Rapport, 1930–31: 250. Desjardins, Guide parl., 133–34. Archange Godbout, “Nos ancêtres au XVIIe siècle,” ANQ Rapport, 1951–53: 481. Officers of British forces in Canada (Irving), 167. Léon Pouliot, “Inventaire analytique de la correspondance de Mgr Ignace Bourget pour l’année 1846,” ANQ Rapport, 1965: 103. Turcotte, Le Conseil législatif, 240. R. S. Greenfield, “La Banque du peuple, 1835–1871, and its failure, 1895” (ma thesis, McGill Univ., Montreal, 1968). Rumilly, Hist. de Montréal, 2: 116. Sulte, Hist. de la milice, 28. J. 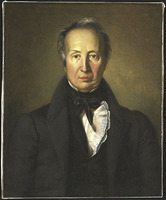 [E.] Hare, “L’Assemblée législative du Bas-Canada, 1792–1814: députation et polarisation politique,” RHAF, 27 (1973–74): 379–80. J.-J. Lefebvre, “La vie sociale du grand Papineau,” RHAF, 11 (1957–58): 479. É.-Z. 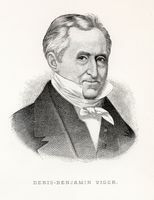 Massicotte, “Louis Roy, dit Portelance, député de Montréal de 1804 à 1820,” BRH, 32 (1926): 169. P.-G. Roy, “La famille Glackemeyer,” BRH, 22 (1916): 202–3. J.-P. Wallot, “La querelle des prisons (Bas-Canada, 1805–1807),” RHAF, 14 (1960–61): 69–70, 262, 265, 267–68. Lise St-Georges, “ROY PORTELANCE, LOUIS,” in Dictionary of Canadian Biography, vol. 7, University of Toronto/Université Laval, 2003–, accessed April 21, 2019, http://www.biographi.ca/en/bio/roy_portelance_louis_7E.html.